The Committee Band first played in January 1985 at the Knees Up Cecil Sharp at Cecil Sharp House in London. The original members (Cathy Cook, Diane Moody, Martin Nail, Mary Panton, Gordon Potts, and the late Dave Roberts) were all members of the committee which organises the Knees-Ups. The original idea was to use the talents of committee members to avoid having to pay for a band. It soon became the practice to invite non-committee members to play and for some years the line-up was somewhat variable. 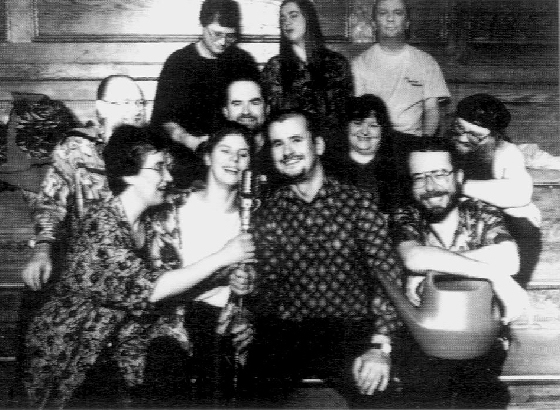 From 1990 to 1993 the Band played each year for the Drill Hall ceilidhs at the Sidmouth International Festival of Folk Arts, and during this period also settled down to a more fixed line-up and adopted Nick Walden as its regular caller. In recent years it has played both at festivals and for many of the regular ceilidhs series in southern England, and has released three CDs. For many years Ian, Hilda, Diane, Gordon and Martin formed one of the resident bands at the Islington Folk Club in London. Our farewell dance was the 2010 Christmas Knees-Up at Cecil Sharp House, 25 years after our debut there. We missed playing together so we have decided to rise phoenix-like and our first gig is the Christmas Knees-up at Cecil Sharp House on 15th December 2017. The members of the band are now exploring pastures old and new -- Ian, Hilda, Gordon, Diane and MJ have formed a new London-based band called Panjandrum, and no doubt other musical phoenixes will spring from the ashes as time goes on.